I went up to The Back Stop this weekend after I stopped at the bank. The Back Stop is the home to Dr. Wax. I occasionally stop in when I am in the Toms River, NJ area. It's about a 45-minute ride and since there is no bank branch in my area and the closest one is in Toms River, it just seemed like a natural fit to go over and visit Dr. Wax. I hadn't been there in quite some time, so I paid Dr. Wax a visit. We had a great conversation, which could mean some exciting things for the future of A Cardboard Problem. Some of you who were at our live case break might get what you asked for, but in the meantime, I also bought a card from Dr. Wax. Unfortunately, he doesn't have tons of Jeters because of the area. It's right on the border of Yankees and Phillies fans and there are tons of guys who go there and grab his cards, which usually leaves me with a tiny inventory. I did find one card and made sure I deposited my check before I got there. I love the two different grains on this card. The great thing about the card is that it's two guys who have a little home in my heart. Bernie Williams and Derek Jeter will always make me smile when I think back to 1996, 98, 99 and, of course, 2000. What did people ask for during your case break? Just kidding. I don't think he would want his card shop to get so messy. Hey that's the same card store Chris of Stale Gum fame shops at. Coool. Nice card. Bernie was one of my favorites. Yep. I'm going up there this weekend to videobreak a box of UD. 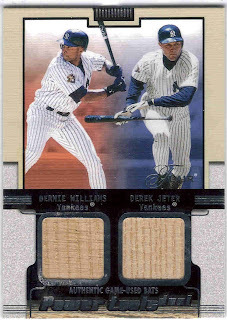 OBTW, I have that same exact Flair double bat card of Jeter and Williams -- only I got mine out of a pack. Oh, he got them in? He didn't have any last weekend and said you were up there looking for them as well. You coulda sold me that card. He said he'd have some UD wax in this weekend. Best to call ahead though. I have a Jeter jersey from this year's UD with your name on it -- you know, if you're interested. I'm ok with that. I just went to checklist and saw I have that card, so I'm not bothered by it (unless you wanted to purchase it). I just need one of each card.